You’ve just come back from the store looking for the perfect greeting card. Even if you find one you like, you may not be willing to shell out the amount they’re asking for it. Learn how to make springtime pop-up cards and you’ll be able to give a one-of-a-kind card your intended recipient will love. Using colored pencils in various shades of green, create the grass for your flower garden. You can make the grass using sweeping lines similar to real grass, or stylized depending upon your artistic skill. On a separate sheet of stock, draw the flower garden with as many flowers as you’d like. Color the flowers and then cut them out. Use Mod Podge or another craft glue to glue the image onto the tab using a paintbrush to ensure the glue is even and stays on the tab. If you’d like to make multiple layers of pop-ups, fold the paper in several areas and use the same steps to create the tabs for the pop-up. Then glue a different element of the card on each tab. This will provide a 3-D effect for the recipient. Use scrapbooking paper to cut out the words “Happy Spring” or another greeting. Glue those onto the card behind the flower garden. You may also want to put butterfly or bee stickers on the page to look like they’re flying around the flowers. Using a piece of construction paper, create a cover for the card, ensuring the size is a little larger than the card stock. Fold that in half and glue the card stock into the center of the construction paper. This will ensure the recipient won’t notice the hole for the pop-up before they open the card. Decorate the front of the card with photographs you’ve taken, photos you’ve cut out of a magazine, or drawings you’ve made. Add stickers to decorate the card to create a springtime image. Don’t forget to leave room for a greeting on the front of the card. Many children and adults enjoy knowing how to make springtime pop-up cards to give to loved ones. Of course, once you get started making pop-up cards, you may decide store-bought cards pale in comparison. Visit Stampin’ Up! to purchase beautiful scrapbooking paper, rubber stamps, cardstock in more for all your spring (and summer, fall and winter) projects! Turkeys are a well-known symbol of Thanksgiving. They’re a favorite subject of crafters who want to make Thanksgiving centerpieces and other decorations. And for kids, turkey projects provide a great opportunity to discuss the tradition of Thanksgiving. This paper plate turkey is a craft that kids of all ages can do. Here’s how to make it. 1. Use the brown crayon, colored pencil, marker or paint to color bottom side of the plate brown. If using paint, let dry. 2. Draw an elongated oval or peanut shape on a piece of brown construction paper to make the turkey’s head and neck. Cut out and glue onto the center of the plate, with the top hanging over the edge. 3. Cut a triangle out of the yellow or orange construction paper for the beak, and a teardrop shape out of the red construction paper for the waddle. Cut legs and feet out of orange or yellow construction paper. Glue into place. 4. Glue on the googly eyes. Let dry. 5. Draw a feather shape on a piece of red, yellow or orange construction paper. Cut it out, and trace it onto construction paper in each of those three colors several times. Cut out all of the feathers you traced. 6. Turn the plate over and glue the feathers around the top and sides of the plate, placing the bottoms of them about an inch from the edge. Let dry. * If you prefer, you could use craft feathers instead of cutting them out of construction paper. If you do, keep in mind that they will stick better with craft glue than they will with a glue stick. * If you don’t have any googly eyes, cut some eyes out of white construction paper or card stock and draw black dots in the centers. * No paper plates handy? Just cut a large circle out of brown construction paper for the body. * You can convert this craft to make a peacock for a non-seasonal project. Just make the head and body blue instead of brown, omit the waddle, and use brightly colored feathers. For the spots on the feathers, kids can dip their thumbs in finger paint and stick them in random places. * Stick a magnet on the back of your completed turkey and hang it on the refrigerator, tack it to the front door, or use string to hang it from the ceiling. When most of us think of Thanksgiving, we think of a big dinner with the family. Some of us cook that all day, create beautiful centerpieces for the table and deck our homes out in fall colors. Others bring a drink or a dish and join someone else in the family for dinner. Either way, we enjoy one another’s company and take advantage of the long weekend. Family and food are certainly important parts of the Thanksgiving holiday. But there is more to Thanksgiving than that. The first Thanksgiving was all about giving thanks for the bountiful harvest, as well as for the other good things that we often take for granted. But that part is often forgotten in the hustle and bustle of putting together an event for the family. If you want to put the “thanks” back in Thanksgiving, a little creativity can help. Starting a Thanksgiving journal is a great way to get everyone thinking about the many things they have to be grateful for. Such an occasion calls for an extra special hand-decorated journal. You can make one in a snap with a few scrapbooking supplies, and the kids can even help, making it a family effort. 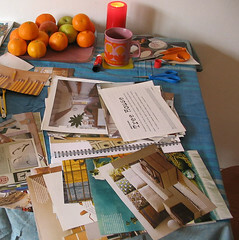 Here’s how to make your own Thanksgiving journal. 1. Use the glue stick to apply a uniform coat of glue on the front cover of the journal. Do not put any glue on the spine, but make sure to get it all the way to each edge of the cover itself. 2. Place a piece of scrapbooking paper on top of the journal, up against the spine. Press down firmly and smooth so that there are no bubbles. 3. Open the cover of the journal, and cut the scrapbooking paper even with it. 4. Do the same thing with the back cover of the journal. You could use the same paper as you used on the front, or a co-ordinating solid color. 5. Add ribbon, stickers, die cuts or any other embellishments you like to the front cover of the journal. Let glue set well before using. Now that you have a beautiful Thanksgiving journal, it’s time to put it to good use. When your guests arrive, or after dinner, ask each one of them to write down some things that they’re thankful for. You could also encourage them to share memories of past Thanksgivings if you like. Make sure they put their name at the top or bottom of the page. This will give you a keepsake to treasure for years to come. Here’s a fun Thanksgiving day craft that the whole family can do! When it comes to Thanksgiving, one of the highlights for children is making crafts. There are lots of great projects that they can create to commemorate the arrival of the pilgrims. Many particularly enjoy making things they can wear, so this pioneer’s bonnet is sure to be a hit. And for teachers who are having a Thanksgiving play or a pilgrim dress-up day, it can be particularly useful. Here is how to make it. 1. Open the paper bag and lay it on one of the narrow sides. On the top narrow side, cut down the center from the top to approximately 4 inches from the bottom. Then cut from that point to the fold on both sides, creating two flaps. 2. Open the flaps outward and turn the bag over, with the flap side down. Flatten it slightly at the open end. 3. On the uncut narrow side, measure 12 inches from the bottom of the bag and make a mark. Draw an arch starting at that point and going around to the other edge of one side of the bag. Cut on the line, going through both sides of the bag at once. 4. Open the bonnet. Tuck in the corners of the bottom of the bag to give it a more rounded appearance. 5. Fold the piece of construction paper in half lengthwise. Tape the paper inside the top of the bonnet, with the folded edge parallel with the back and about 2 inches from it. 6. Cut a slit in the fold of each side flap of the bonnet, about 4 inches from the front. Place the ribbon over the top of the bonnet, thread it through the slits, and fold the flaps up a bit. Put the bonnet on the child’s head and tie underneath the chin. * If you can find them, white paper bags make an especially pretty bonnet. But they also look lovely in brown. * It doesn’t matter what color of construction paper you use, but light colors are less likely to show through the finished bonnet – especially if the bag you’re using is thin or white. If you don’t have any construction paper, card stock also works well. * Curling the ends of the ribbon after it’s tied adds a nice touch. To do this, open a pair of scissors, place the flat part of the blade against the underside close to the tied part, and run the blade along the length quickly, going all the way to the end.